The traditional milk and cookies for afternoon tea. We all remember having it after school. I still have it ready for the kids when they come home from school. It’s a nice tradition that has been passed down generation after generation. But THIS version is a whole lot healthier. No sugar, no additives, no preservatives. It will really get them in the headspace for homework or just chilling out when they get home from a tough day at school. 4. Strain the almond meal from the liquid. I use a nutbag but you can use a clean cloth. 5. Voila! 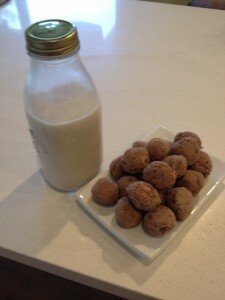 Almond milk in the fridge ready for Milk and Cookies. NB: Almond milk lasts for about 5 days in the fridge. You can also use it on cereals or to whip up a smoothie. 4. Roll into balls and place in freezer for about 10 minutes to go hard and then enjoy. Whip up a berry smoothie using the almond milk you’ve already made, grab some yummy cacao balls and you have the perfect afternoon snack for you AND the kids.